The two Taft boys, Bud and Holly, were the constant playmates—and sometime schoolmates—of Willie and Tad Lincoln until Willie’s death in February 1862. When Willie was dying, Bud held a vigil at Willie’s deathbed. “If I go he will call for me,” he told the President when Mr. Lincoln urged Bud to get some rest. 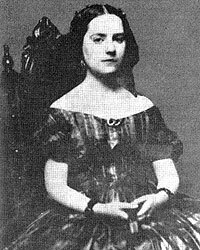 But Mary Lincoln banished the two boys from Willie’s memorial service, writing the Tafts’ mother: “Please keep the boys home the day of the funeral. It makes me feel worse to see them.”1 Perhaps one reason was that the Taft and Lincoln boys looked remarkably alike. Once, as I was sitting on the sofa with some silk and velvet pieces on my lap, out of which I was trying to make a pin-cushion, the President came into the room. I rose at once, my pieces falling on the floor. When the President went out, I picked them up and was just getting them sorted out again when he came in the second time. True to my training, I again rose and the silk once more scattered to the floor. ‘You needn’t get up, Julia, every time Abram comes in the room,’ said Mrs. Lincoln. ‘Why, Julie,’ said the President, noticing my silk pieces on the floor, ‘that’s too bad.’ Before I knew what he was about, he had knelt on the floor and was picking up the pieces of silk for me. Greatly embarrassed at this presidential gallantry, I darted forward to help him and together we picked them up. Charles Sabin Taft, an older half-brother, was a doctor who treated President Lincoln after he was shot on April 14, 1865 Julia Taft subsequently married a Congregational minister. Julia Taft Bayne, Tad Lincoln’s Father, pp. 199-200. Taft, Tad Lincoln’s Father, pp. 12-13. Taft, Tad Lincoln’s Father, pp. 44-45. Taft, Tad Lincoln’s Father, p. 163. Taft, Tad Lincoln’s Father, pp. 43-47. Taft, Tad Lincoln’s Father, p. 201. Taft, Tad Lincoln’s Father, pp. 109-110. Taft, Tad Lincoln’s Father, p. 88-89.